“UFC on FX: Belfort vs. Bisping” takes place Saturday inside Ginasio do Ibirapuera in Sao Paulo, Brazil. The first preliminary bout is scheduled to start at approximately 5:35PM ET/2:35PM PT. Make sure to stay with 5thRound.com all night for our live coverage. Facebook will kick off the festivities by streaming the card’s opening bout. Fans simply have to “Like” the UFC’s page in order to watch the scrap live. FUEL TV will then broadcast the remaining four preliminary bouts live beginning at 6PM ET/3PM PT. FX airs the main card starting at 9PM ET/6PM PT. 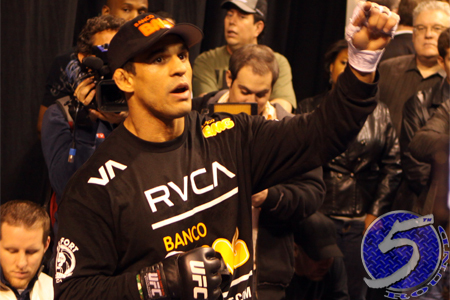 Saturday’s show will feature a middleweight shootout between Vitor Belfort (Pictured) and Michael Bisping. “The Count” will earn next dibs at Anderson Silva’s 185-pound crown with a victory.